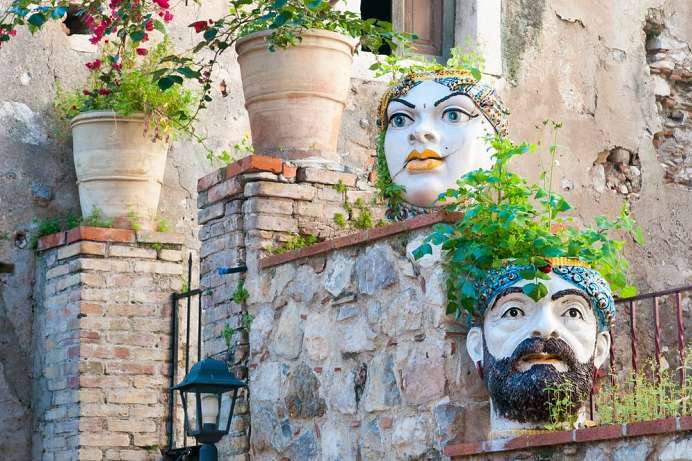 Despite its popularity as a tourist destination, Taormina remains one of the most fascinating towns in Sicily. The once tranquil village was “discovered” by German artist Otto von Geleng, who was overwhelmed by the image of a Greek amphitheater on a cliff high above the sea against the majestic background of a snow-topped volcano. In the spring the landscape was enhanced by an abundance of flowers never before experienced by the northern European. His romantic paintings in the second half of the 20th century drew the attention of sun-starved northerners to the “tip of paradise” in Sicily. It wasn't long before a direct train connection was established from London to Taormina via Paris. The first hotels soon opened their doors to such illustrious guests as the Krupps, the Rothschilds and King George V. Today the town center, which was only accessible by mule 150 years ago, is a vibrant pedestrian zone. Most of the historical hotels are situated below the Old Town, where the views that made Taormina famous can still be enjoyed. A cable car leads down to the pebble beach along the bay. 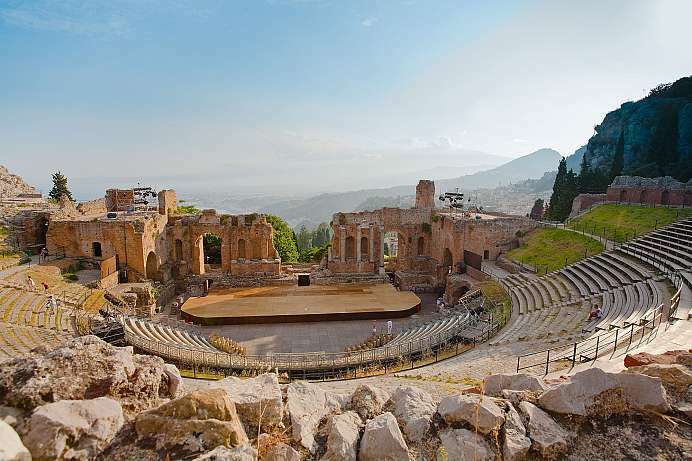 The ancient theater of Taormina takes second place after the theater of Syrakus for the largest theater in Sicily. Despite its name, it was built by the Romans in the 2nd century AD on top of a Greek theater from the 3rd century BC. The new Roman structure was needed as plays were replaced by bloody gladiatorial games. Today it is regarded as the most beautiful theater in the Mediterranean world. The upper-level seats, which back then were actually the worst, offer a unique view of Mount Etna and the sea.